Glossier are a very well known brand at this point. Having launched in the UK almost a year ago, there's been some time to test out the brands products. I've primarily invested in their makeup, designed to work simultaneously as skincare - which makes a big difference as the products feel like they aren't just on your skin, but doing something whilst there. 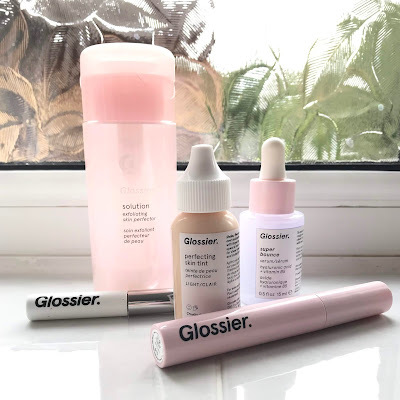 So, I thought I'd let you know my top 5 Glossier products. Some are newer releases, and others were in the first order I made and I've since repurchased. Of course the Solution was going to make the top 5, but even I'm surprised it wasn't higher up. This stuff is just great. It's effectively a gentle acid that helps to exfoliate the skin, keeping it clean and therefore helping rid the skin of blemishes and evening skin tone. This has worked well for me since I first used it at the beginning of the year and it's safe to say I can see myself using it for many years to come. I now use it every other day, instead of everyday as I did originally, as it's made such a difference to my skin that I don't feel the need for it everyday. The only qualm I ever had about the Solution was that my skin often felt rather dry the following morning. I saw someone online mention that they used Super Bounce the morning after they had used the Solution and it rehydrated there skin really nicely. Having started using it only recently, I'm glad to say that it's certainly worked the same for me. Super Bounce is a hyaluronic acid vitamin B5 serum - it brings back the softness and resultantly the 'bounce' to your skin, leaving it smooth and hydrated without any waiting around for it to sink in. Love this stuff. Next up is the Boy Brow. This has quickly become a cult classic in the brow world. To begin with I didn't love it, but I think as the product began to dry a little it became the perfect consistency for me. I am very much a lazy girl when it comes to brows: I've never bothered using a pencil or such to fill them in, opting for a brow gel to just add a bit of volume and fill the little areas that are on the sparse side. This is a great product for that. I use the brown shade and it blends in with my natural brow colour really nicely. As much as the Lash Slick is a very new release from Glossier, I can wholeheartedly say that it deserves the number 2 position. For, I kid you not, about eight months, I've avoided using mascara almost completely. And the reason for this was that I just hated every formula I had and that I came across, to the point that I couldn't bear the thought of using any of them. Nothing looked nice or went on how I wanted and I ended up so discontented every time I tried using mascara. Lash Slick was - not to be dramatic or anything - the last mascara product I was willing to try before I gave up on it forever, and I'm glad to say it was everything I could possibly want in a mascara. It separates and lengthens, giving your eyelashes amazing definition, yet still looking on the more natural side. It also comes off really easily - another major issue I have with every other mascara - with just a little micellar water. A dream. And the product reaching the number 1 spot is, of course, the Perfecting Skin Tint. I am, through and through, a skin tint/tinted moisturiser kind of girl, so I certainly know what I like in this sort of product. The Glossier Skin Tint does not disappoint. One thing I often find difficult is to find a shade light enough for my complexion, as a lot of the time brands seem to struggle to get a super pale shade and even the lightest colour is too dark for me. But Glossier have gotten it just right and the shade combined with the formula gets 10/10. It is a weightless product that works to even out skin tone without losing sight of your natural features, whilst at the same time it effectively hydrates the skin. My skin feels nicer after I've taken the product off at the end of the day than before I put it on in the morning, which is definitely hard to come by. The best. A worthy winner. Have you tried any Glossier products? What are your favourites?